Ms. Hynes' class: Oh Susanna! 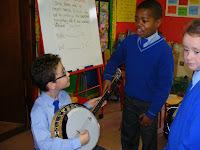 We learned the song 'Oh Susanna'. It is a march. When soldiers were away at war they used to sing songs about their loved ones when they were marching. 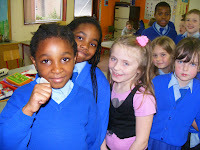 We marched around our classroom to the beat singing this song pretending to be soldiers! 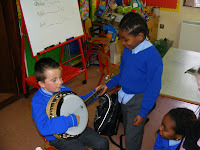 When we listened to the song we could hear a banjo playing along and even got to hold a real one and pluck the strings using a plectrum. 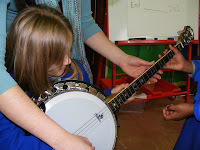 We could feel the vibrations the strings made when we plucked them also! It was lots of fun! !